Patients with fractured souls, clients threatened by deadly ancestor spirits, and now the paparazzi–it’s all in a day’s work for techno-shaman Olivia Lawson. 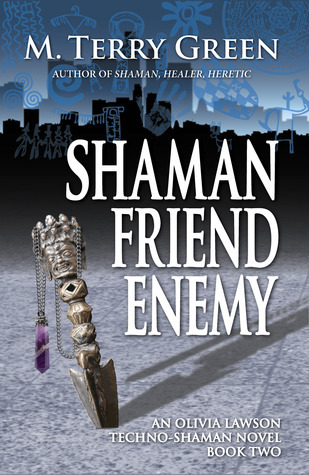 Livvy has rocketed to the top of the shaman world, bringing old friends with her but also attracting new enemies. Having enjoyed the first book in this series, I was keen to see how the sequel would measure up and overall I was happy. This book didn't have the immediate impact of the first one for me. With the first book I was caught from the first page, but this one took me a few chapters before I really got into in. After that, though, I was pulled into the story and characters again. One of the things I enjoyed about this instalment was the fact we get to see a bit more of Livvy's background and also a bit more information about the world of the shamans and their powers. I would recommend reading these books in order as this one does refer back to the previous one several times and relies on some knowledge of what went on and who the characters are. More good urban fantasy action and I would happily read on in this series if the author brings out a third book.